Admission is free and open to the public, all ages welcome, wheelchair accessible. 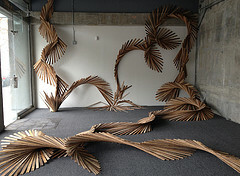 Exhibitions at 1045 Mission Street are a collaboration between the Recology Artist in Residence Program and SOMA Residencies. Artwork is made by former Recology artists-in-residence from materials that San Franciscans have thrown away.The Artist in Residence Program at Recology San Francisco is a one-of-a-kind initiative started in 1990 to support Bay Area artists while teaching children and adults about recycling and resource conservation. Artists work for four months in a studio space on site and use materials recovered from the Public Disposal Area. Over ninety professional Bay Area artists have completed residencies. Applications are accepted annually in August. 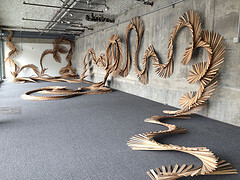 I’m glad Barbara Holmes had used the 100-foot-long exhibition space and save that trash and turned it into art. Ever Wonder What to do With Small Amounts of Cooking Oil?